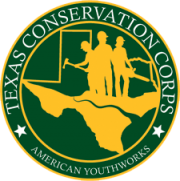 The Texas Conservation Corps (TxCC) empowers the lives of young adults through conservation education, service and jobs training. Hands-on, skills based projects put program participants in front of the regional environmental problems and asks them to be the solution. While successfully educating, training and producing the next generation of leaders in the conservation world, TxCC is known as a powerful resource in the conservation of the natural landscape of Texas and the surrounding region. Throughout their terms of service, TxCC members will build trails, fell hazard trees, tackle exotic plant management, restore habitat for wildlife, respond to disasters, and be exposed to heavy equipment operation and minor construction.